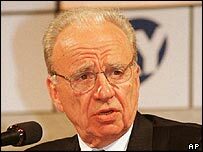 BBC NEWS | UK | Politics | Is Murdoch ready to back Tories? Is Murdoch ready to back Tories? One of Tony Blair's greatest pre-1997 election victories was to win Rupert Murdoch and his Sun newspaper over to New Labour. So the prime minister will be getting increasingly nervous at signs that the press baron may be toying with the idea of abandoning him at the next election. The latest evidence to support this possibility is Mr Murdoch's invitation to Michael Howard to address one of the irregular meetings of his News Corporation executives. These are rarely held meetings, and when Mr Howard speaks at the next one, in Cancun, Mexico on March 18, he will be the first UK political leader to do so since Mr Blair addressed the group in 1995. Needless to say, the Tory party is being suitably modest and simply declaring its delight at the invitation. But Mr Howard intends to use it to deliver a wide-ranging speech aimed specifically at pushing Mr Murdoch further down the road towards throwing his weight behind the Tories at the next election, still expected in just over a year's time. The latest development comes just a couple of months after Mr Murdoch publicly declared he may be willing to back Mr Howard at the next election. He said he was still worried about more power being given to Europe and wanted to see if Mr Howard could turn Tory fortunes around. The mere suggestion that the Sun - and to a lesser extent the Times - might urge people to vote Tory at the next election is enough to spark outbreaks of euphoria in Central Office and heartburn in Downing Street. Both newspapers had been traditionally Tory supporters, but along with hundreds of thousands of voters, switched horses in 1997. No political leader believes Mr Murdoch can win or lose elections for them. But he can certainly exert huge influence. And there may already be signs that some of his concerns over Labour may be being removed. It now looks virtually certain that Tony Blair will, in effect, rule out joining the single currency in this parliament - a non-runner in any case at this stage in the electoral cycle. And any fears Mr Murdoch might have had over the creation of a European constitution may have eased after that ran into the sand, with little indication it is about to be revived any time soon. At the same time, he has supported the government over the war on Iraq and says he will not easily forget Tony Blair's "courage". But this latest development will serve as both a boost to the Tories, and give them further encouragement to keep their act together, and as a warning to the prime minister not to take his former ally for granted. Some will even suggest it could feed into the government's policy making process between now and the election - a suggestion which would be roundly rejected by Downing Street. Either way, with one simple invitation to speak, Mr Murdoch has again displayed just how central he and his newspapers can be on the British political scene. 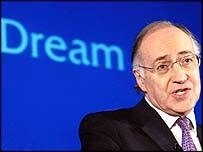 "He warned Labour that the support of his papers... can't be taken for granted"